On Sunday, Professor Chaos issued a challenge to me regarding the complexity of my recipes. I replied yesterday with a 1-2 punch of Carne Asada and Arroz con Pollo, issuing in turn a challenge of my own -- to both Professor Chaos and myself. The good professor has not let me down. And so, true to my word, I ovver the following recipe in return. As promised, it contains a meat of my choice, 1 ingredient from Prof. C's cupboard, one from his fridge (go ahead and drink the beer, sir, it's safe for now). Preheat oven to 325 F. Lightly coat chicken breasts with mayonnaise, then coat with bread crumbs. Place on a cookie sheet, bake for 15 minutes. Turn over, continue baking until the coating is golden brown. 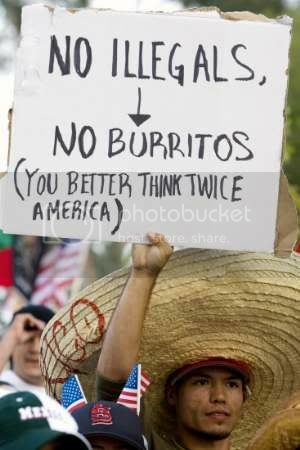 In response to the "Day Without Immigrants" that occureed on Pinko de Mayo er... May 1 (heh. Thanks, Vic), someone has come up with a great way to repsond -- "Nothing Mexican Day" -- a day without customers -- on Friday, May 5 (Cinco De Mayo). I called the coordinator yesterday, since she had told me in March that I should hear by the end of April. One of the two chef instructors who make the decisions on who gets accepted hasn't reviewd the applications yet, so not only do *I* not know if I'm in yet, *THEY* don't know either. Thanks for the Memory toDrudge via Mr. Priapus via 1 Girl, 4 Martinis. My first reaction was anger, fear and panic. No burritos? What a world, what a world. But then I remembered how easily we've assimilated pizza, and now I can sleep at night (except for the gas -- I reallly need to use fewer beans next time).